OUCH! What’s behind that pain in your elbow? If when you grab your aerial silks, trapeze, or rope and the inside of your elbow shouts with sharp pain, you could be suffering from “climber’s elbow” otherwise known as medial epicondylosis. But, what exactly is going on and what can you do about it? That super tender spot on the inside of your elbow is the medial epicondyle. This knobby bump on the ulnar (pinky side) of the elbow where the common flexor tendon attaches the wrist and finger flexor muscles, and the pronantor teres to the bone. 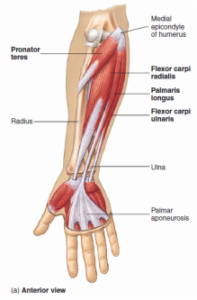 These are the muscles that you use to flex your fingers and grasp your apparatus, to turn your palms facing outward, like to grip a trapeze, and to bend your wrist toward the pinky side of the hand, as with vertical apparatus. So, basically, all the muscles we hang our entire body weight from. Often injury to this tendon is due to overuse, either from over training with too little rest, or from muscle imbalances in the body that make these muscles work overtime. Overuse and muscular imbalance is incredibly common due to how our lives revolve around finger flexion. These are the same muscles we use to type and use those ‘”wonderful” track pads on our laptops. Considering that not only are we aerialists, but also participants in the digital age, this gets tricky. It is hopefully becoming clearer why the tendons attaching to the medial epicondyle are constantly subjected to sustained stress and are vulnerable to microtauma. Microtauma is normal and given adequate rest the body can repair the tendons to a higher level of capability to endure the stresses we put on it. However, without that rest the strong repeated muscle contractions can result in injury. If you find yourself rubbing your elbows while training or having lingering pain there is hope. Find yourself a great physical therapist and get guidance on the rehab pathyway to pain free aerial practice. Tendons respond best when you load them properly and give them rest to rebuild. If your pain is due to muscle imbalance and poor function, then your movement patterns are what need to change first. To quote a leading researcher in the field, Dr. Jill Cook, “With poor function you will never be out of pain. To get out of pain, improve function.” Having someone take a look at how the whole body, shoulder, and wrist are working can be the key to being pain-free and will get you prepared to rehab the tendon itself. For more info and links to relevant articles click here. There are four phases to tendon treatment: isometrics to reduce pain, isotonics for strengthening, fast eccentrics to improve energy storage, and sport specific training and loading. The first step in healing is stopping the cycle of pain and teaching the brain that though the muscles are firing, your elbow does NOT have to hurt. In isometric contractions, the muscle length and joint angle do not change. To do this, hold a heavy load (~75% max) for 45 seconds with the wrist and/ or fingers (depending on which tissues are most irritated) in a mid range position with the forearm supported on a table 5 times. By the second or third repetition this should be pain free, and without pain your strength will already be about 19% increased! Once you are pain free, the next step is to strengthen the muscles and load the tendons slowly and avoiding fatigue. Begining with eccentric (lengthening) and moving toward concentric (shortening) contractions with an even amount of weight throughout the movement. As you are loading the tissue it is important that you have no pain for a full 24 hours after each session before you increase weight or resistance. Tendons are the springs in our system and need to be able store energy without pain. At this phase you will begin to perform fast eccentric contractions to mimic the loads that your tendons go through in daily life with about 48 hours of rest to allow for remodeling. Congratulations!!! You are back to (less modified) training and feeling pretty great. Now is the time to work on your grip endurance and your ability to absorb the force of doing smaller to larger release moves and re-grips. Tendons may take a while to heal, but they will heal. The earlier you recognize your symptoms and get help, the sooner you will be back in the air and feeling great. I know we all love to stretch, but please AVOID stretching your flexor tendons. I know, everyone tells you to stretch, but here’s why you shouldn’t. The mechanism of injury to the tendon is excessive load that increases the tensive and compressive forces on the tendon. So, when you think about what stretching does, it INCREASES the tension and therefore the load on the tendon pressing it against the epicondyle and irritating the tissue further. As far as technology goes, track pads can be killer on the flexor tendons. GET a MOUSE. It can be a cheap and very effective way to decrease your daily symptoms and help you feel more comfortable throughout your day and in the air. Also, try to limit phone time in general. Just holding those little buggers and swiping can get irritating after a while.